If you have a question for me, leave it in the comment section below and I’ll reply! Please allow me to introduce myself as the school librarian at European School RheinMain. Every year I plan author visits and readings for the upcoming academic year for both – Primary and Secondary School, German and English Section. I am currently planning for 2017/2018 and would like to ask about the chances as well as terms and conditions for one or two readings ( Or more, in case colleagues from other schools would join). It usually is within our means to offer 250 (if more than one reading) – 350 EUR + travel + hotel. We would be very happy to welcome you at our school and assure you of our sincere hospitality. Hello Jo, Will You be doing any more book signings In Portsmouth ? My Daughter missed today when you visited her school. Kind regards Ruth. Hi it’s Lauren (from St Thomas’ FBA- do you remember me?) As I am in year six now, I’m not in FBA anymore (which is disappointing) but still love reading and writing. I’ve read the Electrigirls loads of times and want to read more of your books- what would you recommend for 10 year olds? I sat up and sighed. It was all a bad dream. I hated nightmares. They were horrible and made me believe that they were real, however stupid they were. I slipped on my pink, fluffy slippers and my purple, spotty nightgown then tip-toed past Mum’s room to find Maia’s. I slowly pushed forward the door, letting light cover the small room. The bed was empty. “Maia!” I called as I slipped downstairs, “Are you down here?” I checked the kitchen and living room until I realised that Maia’s shoes weren’t at the back door. We held hands and ran to the back door. Despite being four years apart, me and my sis have so much in common. hei i have a question about MINE. where and when the story takes place? Hello from the IRIS Readers Society of St Johns International School, Waterloo, Belgium. The IRIS readers society is a group of middle schoolers who have read a preselected group of books (12 in total) and then voted on their favourite book. They wanted to contact you and let you know that the Library of Lemons won. Thank you. If you have the time to send a reply to them that would be wonderful. They are presenting the results in their assembly next week. Hii! It wouldn’t let me comment normally so i’ve replied to one of your comments aha. You came to my school today! (St leonards primary) Honestly your so inspiring and i just wanted to say thank you! Also, i just found out your 42 (from what I’ve seen lol) and I was completely gobsmacked! I actually thought you were like 20 haha! Really enjoyed listening to you talking about your books today! Just wandered here to see if you had plans for a fourth Electrigirl book? My daughter Holly has just finished the third and has this morning taken the second to reread at school. She loved them. Thanks! Hi Jo! Happy New Year! We are so excited to have you visit us for a creative writing workshop! 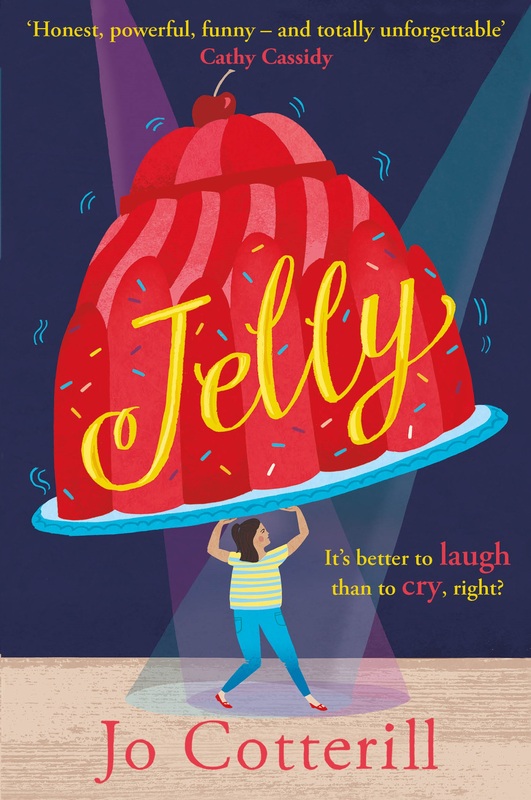 My Year 6 class are beginning to read ‘Jelly’ this term and are already full of questions about writing and your books! Hope to send you a few letters and items before your visit from the children to give you a flavour of our fantastic bunch of Year 6 children we have this year. We look forward to meeting you at Baschurch Primary School in March! thank you for your time sincerely phoenix and emelia. Hi Phoenix and Emelia! I’m so excited to come to Guernsey next week! I believe I’ll be seeing you on Friday 🙂 Excellent questions; here are my answers. 1. My favourite book that I’ve published is probably Looking at the Stars (for ages 11+) because it was the first time I’d attempted something on an epic scale and it felt very personal while I was writing it (the main character Amina is very like me!). My second favourite book is Electrigirl because it was SO MUCH FUN to work on with illustrator Cathy Brett! 2. My favourite dance on Strictly is probably the tango. (My least favourite is the samba.) I would dance with KEVIN FROM GRIMSBY because he’s adorable ♥ 3. My favourite flavour cake is chocolate, always always. Though if you add in cherries as well, and maybe some fresh cream…oooh. Or fudge. But basically chocolate. Always. I have just read all 3 electrigirl books. Is there going to be a 4th? My favourite sports rugby and I really enjoy football running and swimming, at our school we are doing posters about you right now. Hey Jo, I was at the Hounslow Arts centre today (7.3.19) and I asked you a question about my daughter writing and you wrote down something that could help her get her stuff read etc. Unfortunately I have misplaced it and would Rey much appreciate it if you could message me on my email . Many thanks. Sharon Blanks. Dear Ms. Cotterill, I came across your books when researching for an application to Didcot Girls School in Oxfordshire. Sadly, I didn’t get an interview, but having read ‘Three’s a Crowd’, I thought that it would be perfect for my Year 7 SEN nurture class, where I teach at North Oxfordshire Academy in Banbury. This is a class in which we try to help students who are far behind mainstream levels of literacy, who also struggle with behavioural issues to get up to speed enough to be able to access the mainstream curriculum. I just wanted to write to tell you how much they love the book, how engaged they are in your writing and that since we started reading it last week, their focus and joy in English is evident. Thank you! Sophie Anderson. Ooh, while I think of it, my series HOPEWELL HIGH with Bloomsbury is also perfect for your Y7 class! Do have a look – they’re all short easy reads with teen themes too. You’ve recently visited my sons school and he was very taken with you as an author and the support you showed him during one of the small group sessions you did. Hes very interested in a book called Out that you apparently referred to and explained. It’s his birthday next week…..but I can not find the book hes referring to at all! Can you help please?